The world is turning again towards nuclear power, producing readily available energy but also waste toxic for millions of years. What do we leave behind, what will the future inherit from us? How can we as individuals and society deal with the scales and scopes of deep time? How can we make sense of the vast time-scales involved? These questions manifest in our Inheritance Project, which is a series of works about the nuclear contemporary and nuclear deep future. 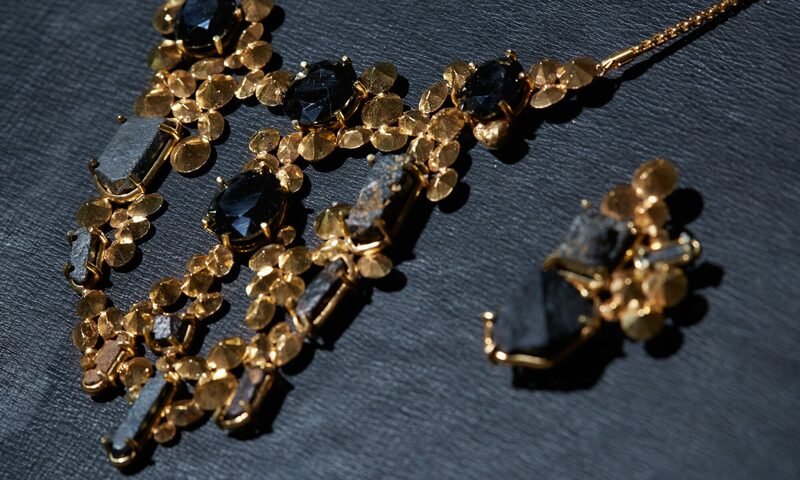 INHERITANCE consists precious jewellery, a necklace, earing and a broche, which are radioactive and therefore rendered practically and symbolically unwearable for deep time, until the radionuclide transmute naturally into a stable and non radioactive isotope of lead. 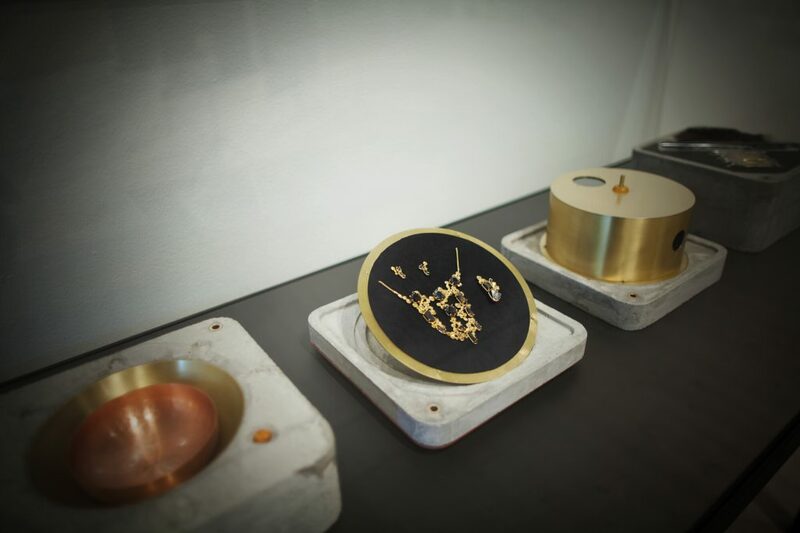 Together with an electromechanical device to determine the remaining radioactivity the jewellery is stored in a concrete container which is build to endure over a vast amount of time. 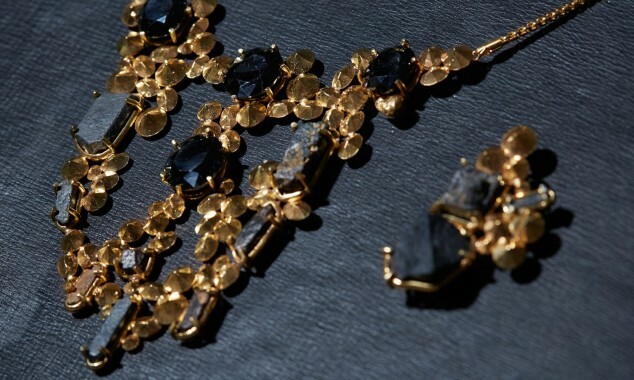 With these items the story goes that each time the jewellery is handed over from one generation to the next, the ritual of measurement determines if the jewellery can finally be brought in use and fulfill its promise of wealth and identity or if it has to be stored away until the next generation. The jewellery is stored in a stackable concrete container which houses all the elements and accessories to perform the ritual of measurement. In the copper top plate the instructions for the ritual are engraved. The uppermost layer contains the time piece which is modelled after one of the first instruments to measure time, a Fenjaan water clock. The next layer contains the accessories to operate the electroscope: spare gold leaves which are the indicator for the electrostatic charge, and a acrylic rod on a piece of rabbit fur to electro-statically charge the electroscope. After that comes the layer with the electroscope, the first instrument which was used to register and measure the phenomena caused be radioactivity, also used by Marie and Pierre Curie in their laboratory (though in a different design). It is based on the principle that radioactivity is able to discharge an electro-statically charged body. The last layer contains the radioactive jewellery. Erich Berger is an artist, curator and cultural worker based in Helsinki. His interests lie in information processes and feedback structures, which he investigates through installations, situations, performances and interfaces. Throughout his artistic practice he has explored the materiality of information and information and technology as artistic material. His current interest in issues of deep time and hybrid ecology led him to work with geological processes, radiogenic phenomena and their socio-political implications in the here and now. Mari Keto explores the limits of artifacts by combining jewellery materials in her installations and portraits . In Keto’s works both the conceptual underpinning and a high degree of craftsmanship merge into an artwork. Keto’s work is strongly research-based. She engages with her subject matter from various perspectives in order to define her own. Pendant l’été 2011, Veit Stratmann a été contacté par l’Agence nationale pour la gestion des déchets radioactifs pour répondre à une demande d’étude, initiée par un groupe de travail qui, au sein de l’agence, réfléchit au moyen de maintenir la mémoire des sites de stockage des déchets nucléaires et l’information sur leur contenu. « Une Colline » constitue, à la fois, une véritable étude, existant seulement comme proposition, mais étant potentiellement réalisable ; et un vrai dispositif plastique.